Yes Saar, you, remember we meet everyday, and almost every working hour in office? Yes, you, the one who comes to my office without any particular reason and talk and talk and keep on talking when I am trying hard to debug the code. Oh! You think it is simple task to find this error among thirty thousand lines do you? Don’t you think it’s high time you went back to your office and did some constructive work or would you rather prefer me to cut your tongue off and gift warp it and give it to you for Christmas? And you Miss the one on telephone from last one hour. I know you had fun last weekend with your new boy friend but I am not interested in knowing the details. I don’t think other people want to know about your new pink silk bed sheet. Would you like to hear me talking loudly about that ugly yellow skirt you are wearing with my friend on phone? No? I didn’t think so. So why don’t you shut up or use your cell phone and just walk out of the office? The main door is just 5 feet from your desk you see! And you Mr & Mrs. Neighbours, would you kindly reduce the volume of your new home theatre system. I know that it’s all nice and all but I don’t think heavy metal music at 2 in the morning is my cup of tea. And I don’t think you will like the rocket I want to fit into your system which will hit the roof and reach sky within a blink of your eyes. Would you? And you Madam, yeah, we met near office cafeteria today afternoon. Yes, you, the one with dark glasses. Didn’t you notice it is winter and it was cloudy and dark outside? I don’t think you are blind because I have seen you many a times without your cool shades. Do you think energy saving lights is too harsh for your eyes? No? Oh! That is your new Gucci shades, is it? I know they are expensive and but it is absolutely fine to remove them when you are inside office building. That doesn’t mean you have to wear them on your head when we all know you will be here till evening. Do I mind? Actually no, but I feel it’s rather uncool to wear cool Gucci shades inside your office building. And you my dear friend, yes I am talking to you, who took her 2 year old to see this awful horror movie. Did you say you have kept your brain locked safely in locker? I thought as much. Any lady with little sense wouldn’t take her kid to these movies and later complain about her kid screaming and wetting his bed at night. And stop bothering me with the details. No, I am not against kids. In fact I adore them. But I would rather prefer to watch Cars, Shreak and Kung Fu Panda with my niece and nephew and scream with them in delight than be a reason for their sleepless nights. So shut up and please grow up!!! Add turmeric powder, a drop of oil and 2 cups of water to washed moong dal and cook till the lentils are cooked though without loosing their shape, about 10-15 mins. Mean while, chop all the vegetables and keep them aside. Heat oil or ghee in a pan and add cumin seeds, mustard seeds, nigella seeds, fenugreek seeds, halved dry red chillies, hing and curry leaves. Sauté for a minute till the spices turn golden brown and aromatic. Next add finely chopped garlic and slit green chillies and sauté for half a minute. Mix in white parts of spring onions along with chopped ginger and sauté till onions becomes translucent, about 1-2 mins. Add garam masala and chopped tomatoes and cook on medium heat for 2 minutes till tomatoes turn pulpy. At this stage add cooked moong dal, jaggery and salt to taste. Pour 1- 1½ cups of water and simmer the dal. Let it cook for another 10-15 minutes so that all the flavours blend well. Mix in lime juice and greens of spring onion and let it cook for another 2-3 minutes. Switch off the flame and add finely chopped coriander leaves. Serve it hot as a soup or along steam cooked Rice or any Indian bread and enjoy. Oooh, you have had a bad day! 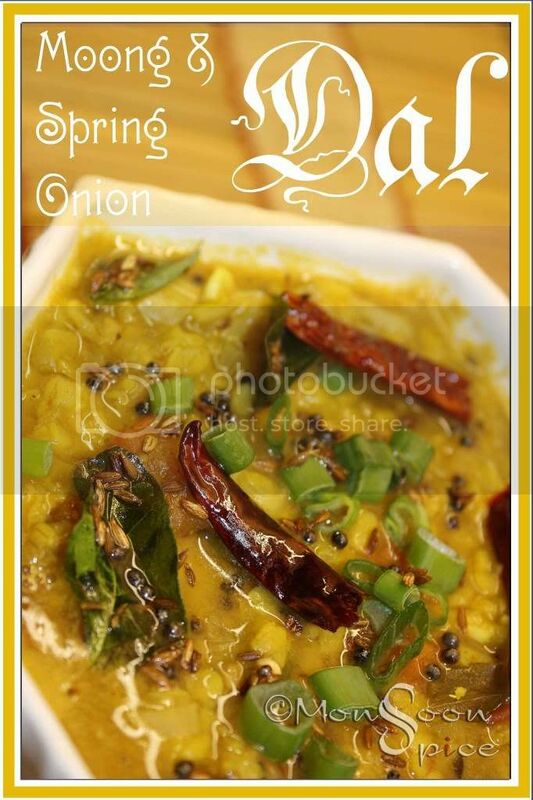 And your dal is the perfect antidote, I think, all yellow, sunny and cheerful. Now, I'm curious to see how much more crabby you can get in your private Crabby Bites blog! Pink silk bed sheets: LOL! I've never understood what it is with people who want to wear shades and caps inside a room. I mean, this woman wanted to show off Gucci, a designer label, fine. But we often see actors here doing such stuff - wearing caps, shades etc indoors - have never been able to figure out why. One actor said it was to keep his hairstyle hidden till his new movie came out but I'm not sure all of them have the same reason, maybe they're all balding and all conscious? And if it's designerwear they want to show off, is there a point, as most people here won't know these labels. This is a mystery I want to solve. 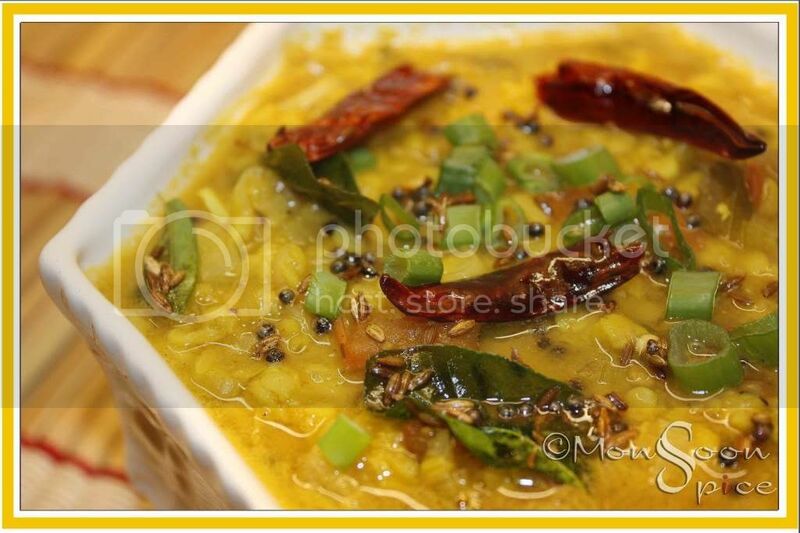 Looks like you really needed that dal:) I love the tempering - it makes me realize I am famished and lazy and not in a mood to cook at all!! 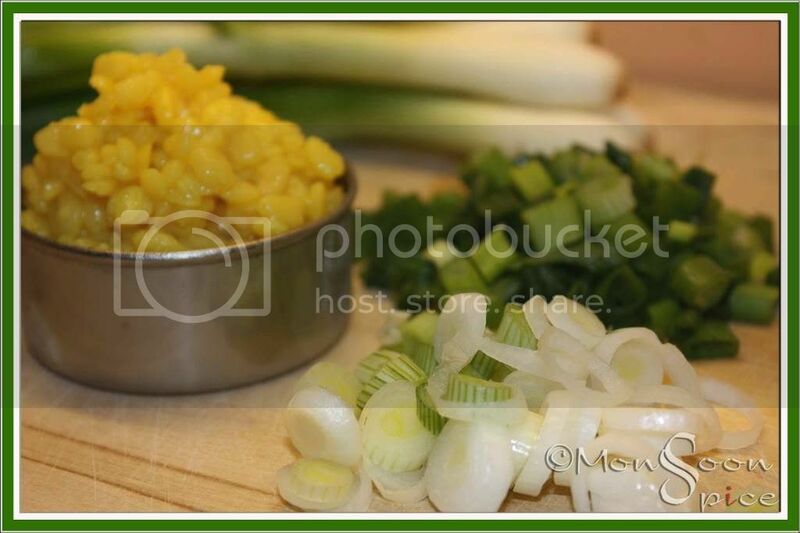 Moong dal and spring onions wow looks scrummy. Here it is really cold, wish i had that bowl of dal, i will cook rice fast and eat the dal with it. beautiful picture as usual Sia.. looks comforting. Looks beautiful. On these cool nights I long for something like this one. I am imagining the taste of this.looks Lovely and the jaggery brings out all the flavours. Sounds good. Will definitely try it. Looks delish ur dish ! Perfect comfort food, love the picture...looks lovely ! Coming to dal,my MIL used to make this one...looks yummy! U a Cancerian by any chance???? :) Seems you had to vent!! Met someone from Aberdeen yday and it's -6 deg there!!! Seems I have to shop for warm clothes on the weekend!! Enjoy the hols! Lovely dal Sia! Very comfort food to cheer up the mood! totally feel your pain. i am so tired with the annoying chatter and artificial laughter around me, i just wear my headphones and listen to national public radio all day. This dish looks amazing, and such beautiful photos you take. Thanks for sharing! Hi Sia..its just recently that i stumbled upon ur blog and tried out this recipe you had posted a while back. It turned out awesome. I have put it up on my blog.